Garage door springs are the parts that support the weight of the panels and provide the tension-based force required to lift and lower them safely. There are two main types - torsion and extension, and they both work very differently. Understanding the differences between them will help you learn how to take care of them better and which type is going to be better suited to your door. This type of system is most commonly used for residential overhead doors that are very heavy. It usually includes a single torsion spring mounted over the center of a specially designed shaft, which is set horizontally above the door. During installation, the spring is wound so that it is loaded with a sufficient amount of force to counterbalance the weight of the panels. On each side of the shaft there is a drum with a lift cable looped over it. The bottom ends of the cables are attached to the lowest section of the door. When the door opens, the torsion spring unwinds and releases the force which it holds. The force is applied to the drums, which rotate and transfer it to the lift cables, which actually lift the door. While the door closes, the spring winds to get loaded with tension once again. Modern torsion springs are made from galvanized steel, which is strong and resistant to corrosion. To reduce the friction between the coils during winding and unwinding, you need to provide them with lubrication maintenance. While standard units of this type have an estimated useful life of 10,000 cycles, there are also more durable ones which are made to last for 15,000 and even 20,000 cycles before they break or require replacement. These units come in pairs. There is one mounted on each side of the door over each horizontal track. During the installation process, the springs are stretched to hold the required amount of force for counterbalancing the door. There are safety cables going through them, and they serve as a way to keep the units in place if they break. The front end of each spring is connected to a set of two pulleys, which have lift cables attached to them. As the door opens, the springs contract to release their stored tension, which is applied to the pulleys and then to the cables. This is how the door is lifted. When it closes, the spring restretch and become loaded with tension again. Extension springs don’t require any special maintenance, but since the system has more components, the risk of failure is higher, so they will need to be inspected regularly to determine when replacement is due. Also, they tend to be less durable and flexible, and their typical lifespan is 5,000 cycles. 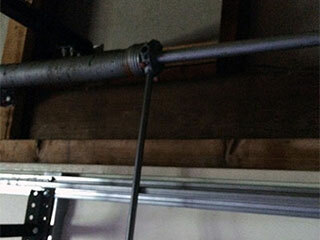 If you require extension or torsion spring replacement, give our experts at Garage Door Repair Trumbull a call. Dealing with these components can be incredibly dangerous, so it's always better to let a professional do it.